Visit the Universal Partner Hotel Vacation Planning Center in the lobby for more details. 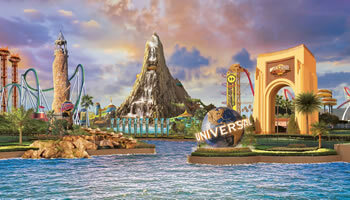 The Vacation Planning Center is staffed with experienced Universal Orlando Resort™ Vacation Planners ready to help with ticket orders, redemptions and whatever else you may need to make your vacation extraordinary. The hotel also offers free scheduled shuttles to SeaWorld® Orlando. Reservations are required for all shuttles and must be made in person at the Universal Partner Hotel Vacation Planning Center located in the hotel lobby one day (24 hours) in advance and up to 30 minutes prior to departure. Contracted groups traveling together are not eligible for free shuttle services. Call group sales for alternative shuttle recommendations. 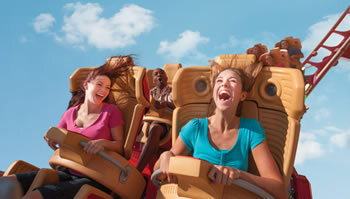 Below are the major Orlando theme parks close to Rosen Inn International. Transportation services to Walt Disney World® theme parks can be arranged from the hotel for a fee. fun for every member of the family. The world’s premiere marine adventure park is also a thrill ride paradise. Come to see orcas, dolphins, sea lions, and manta rays. Stay to enjoy Journey to Atlantis®, Kraken®, and Manta®. At Discovery Cove™ guests experience some of the most exciting animal encounters on the planet. Swim with dolphins, snorkel with tropical fish in our coral reef, and touch, feed, and mingle with hundreds of colorful birds in the free-flight Aviary. Aquatica® is SeaWorld’s® water park. Float through an undersea world of exotic fish, relax on their white sand beaches, or take a tube slide through an underwater world where dolphins swim next to you. Walt Disney World® Resort put Orlando on the map, and the Magic Kingdom® is where it all started. Visit this historic theme park resort and enjoy a magical world of rides, attractions, shows, parades, and more at Epcot®, Animal Kingdom®, Hollywood Studios™, Disney Springs™, and two water parks, Blizzard Beach and Typhoon Lagoon. * Restrictions apply and benefits subject to change without notice. Discounts are not valid at The Wizarding World of Harry Potter, Excludes all Harry Potter merchandise available at Islands of Adventure Trading Company and Universal Studios Store, film, batteries, candy, tobacco, sundries and media. Not valid with any other offers, promotions or discounts. **Hours of operation may vary. ^Reservations are required and must be made in person. Not valid for groups or special events. Transportation schedule and availability is subject to change without notice.